The Point of Aventura North Tower Condominium. The Point North Tower condos for sale. The Point of Aventura North Tower condominium - Constructed in 1997 and designed by well-known architect Robert M. Swedroe, this tower set the standards in design and luxury for all future Point tower developments to follow. Rising 32 stories above The Point grand entrance on Yacht Club Drive, the contemporary whitewashed tower compliments perfectly with the vivid blues and greens of its tropical South Florida setting. It features a dual-column design centered around the two semi-private elevators foyers on each floor. This design gives North Tower residents a high-degree of privacy as only five condominiums share a foyer on each level. The total residences are very large 287 and they all are presented in open floor-plans to give a strong feeling of a single-family living plus sweeping balconies with glass railing so residents can enjoy their views without the usual obstruction of metal bars. 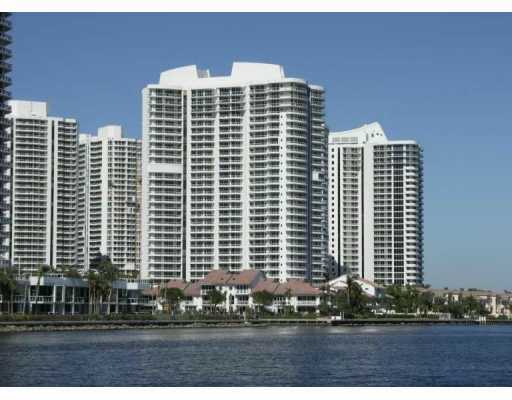 The north side of the tower has spectacular views of the Waterways Point and the Atlantic Ocean; views on the south side feature panoramic vistas of the Turnberry Isle Resort and downtown Aventura over the beautiful Point Marina on the Waterways.